Join Mark Greenaway on this fabulous cookery course set in a beautiful villa near La Rochelle, France. You will have the opportunity to try recipes designed and cooked by Mark, straight from his hugely successful restaurant in Edinburgh that feature in his debut cookbook ‘Perceptions', shortlisted for Gourmand World Cookbook Award 2017. Mark draws on his extensive experience over 20 years to create food that will change perceptions of Scottish cuisine, challenging opinion and showcasing the incredible produce that is available, helping to promote Scotland as a 'world-leading food destination’. This knowledge has been combined with local seasonal produce to create a wonderful ‘summery' menu for you to prepare with the help of Mark and his assistant. The recently designed outdoor kitchen boasts incredible wood-fired cooking facilities which Mark will be using when preparing the delicious menu he has created for you. Enjoy a fresh continental breakfast to set you up for the day, before you jump in to a masterclass with a hands-on approach, an intimate group size, catering for all levels, in this idyllic, relaxed environment. Treat yourself to this exclusive cookery course with a difference, book your place now! 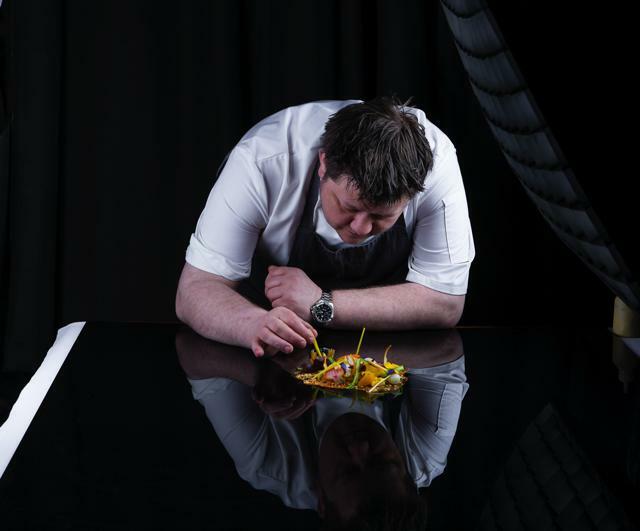 Mark Greenaway received nationwide acclaim following the opening of his eponymous restaurant in Edinburgh in February 2011. Since then, the restaurant has moved to new premises on North Castle Street where the awards and plaudits have continued; Scottish Hotel Awards ‘Rising Star Chef of the Year 2011’, Scottish Style Awards ‘Scotland’s Most Stylish Restaurant 2011’, runner up for ‘Best Restaurant’ at Observer Food Monthly Awards 2015, and recommendations in Good Food Guide 2015, and Michelin Guide 2015. In 2012 it was the only restaurant in Scotland to be newly awarded three AA rosettes for outstanding cuisine which have been retained for the past three years, and has achieved 13th place in Square Meal’s Top 100 UK restaurants 2016, for the second consecutive year. Mark’s debut book, ‘Perceptions: Recipes from Restaurant Mark Greenaway’, was published in July 2016 and won the Gourmand World Cookbook Awards 2017. He also writes a fortnightly recipe column for the heraldscotland.com and has written for Edinburgh Evening News and Scotland Now. Mark has a passion for Scottish ingredients, and uses only the very best local, seasonal produce, transforming them with modern techniques. Mark is a popular spokesperson for Scottish brands and has collaborated with Bowmore whisky in 2013, Nairn’s Oatcakes in 2014-2015, Tennents Whisky Beer in 2015, and was an ambassador for Scottish Food and Drink 2014-2015. Mark was Patron for Bowel Cancer UK in 2015, and in previous year supported campaigns for Marie Curie Cancer, Barnardo's Scotland, Breakthrough Breast Cancer, and MacMillan Cancer. In 2016 he is the regional partner chef for Scotland supporting Le Cordon Bleu UK Scholarship Award, and an ambassador for the Prince's Trust and Young Scot, helping to train and support young people looking for a start in the hospitality industry. More recently, Mark has also won Best Chef at Edinburgh Evening News Restaurant Awards, Edinburgh Chef of the Year 2018 at the Scottish Food Awards and Restaurant Mark Greenaway is listed in Square Meal Top 100 UK Restaurants 2018. On arrival at the villa, Mark Greenaway and his sous chef will welcome you with drinks and an introduction to the weekend course. In the evening, you can sit back and indulge in a four course menu of signature dishes from award-winning Restaurant Mark Greenaway, created by Mark and his chef using the best local produce, with matched wines. Mark will guide you through some rustic and summery dishes, along with some essential cookery skills. Here you will learn how to make your own mayonnaise and bread from scratch, and roast locally sourced meat on a spit or in the outdoor wood oven. After an afternoon of relaxation and exploring the local area it’s time for a challenge! Learn some of the advanced techniques that Mark uses to create his visually stunning dishes, and use seasonal market vegetables to pair with perfectly cooked local game. Step up your bread-making skills and learn how to make your own butter and pesto from scratch. For your final day, Mark will select dishes to suit your ability and ensure you can get the most out of the session. Combining and building on the skills introduced on Saturday, you will learn how to make classic breads and sauces, sorbet and ice cream, and how to enjoy the best of the season’s produce, prepared and cooked to perfection. At the end of the weekend, take home a personally signed copy of Mark’s debut cookbook ‘Perceptions’, featuring the best of modern Scottish and European cooking, with highlights from Mark’s international career.